One of my Aunts has said, if there was only one toy that she could keep and had to get rid of everything else that she would keep Legos. They are great for all ages, genders and kids can use their imagination beyond belief. For me, it is toss up ... I couldn't live without Legos or playdough! Playdough has turned into my in-home babysitter. The kids are completely occupied and content when I am trying to put together dinner or when I need a few minutes to get a project done. I love all the things that they build and what they talk about while they are doing it. My son, Gabriel, loves building lizards and then he sets out 'food' for them and pounds the lizard on the table so all the food sticks to their heads! It's adorable!! I used to buy the store bought playdough. It is always cheap and seems to be everywhere. As the kids got more and more familiar with it, they began to test their boundaries ... what does it smell like and mostly, what does it taste like. This is how kids learn, right? Around Easter time, I began to be über aware of synthetic dyes and in kids food and basically everywhere. 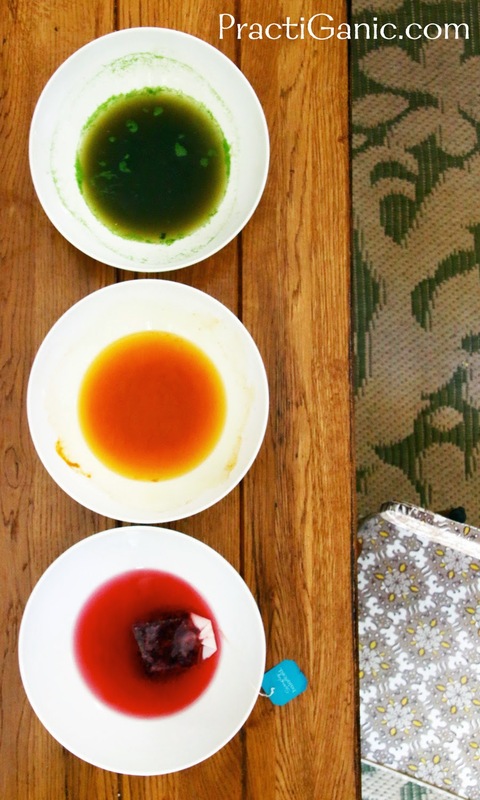 That's when I decided to start making Natural Dye for my Easter Eggs. Having the kids want to eat their playdough really bothered me. So, I actually threw the playdough away during nap time. I knew that I could make a better playdough that was free of synthetic dyes and unnatural ingredients. Gabe was so sad that his playdough was no where to be found so I knew that I had to make some in a hurry. I found an amazing site, The Imagination Tree, that had a million different playdough recipes and ideas (as well as other great learning toys and activities). I figured one out that I wanted to make with just a tweak here and there when I was making it. Also, with my experience with natural dyes for my Easter eggs, I knew I could dye them my way. The next day, Gabe and I made our playdough together. This turned out to be the highlight for me ... it was so fun to make together and he was not only excited to play with his new playdough, but tell everyone that he made it. Now that I started making our playdough from scratch I think I can technically keep both, Legos and playdough! What do you think? 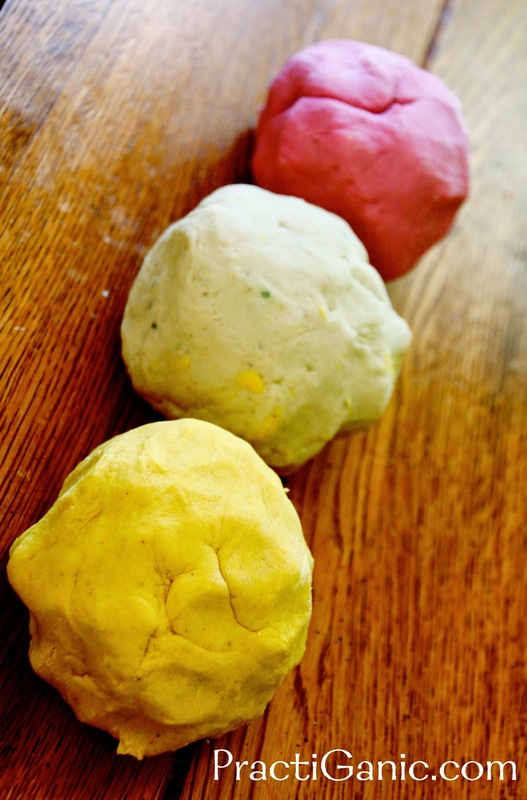 If you don't have any cream of tartar on hand, try this easy 5-minute playdough recipe! Mix all your ingredients then add your boiling water slowly. Stir it up and once it is cool enough to handle, knead it vigorously until it is no longer sticky. The first time I made this, I had to keep adding flour because it was so sticky. Don't be nervous to add a little more flour or water to get the right consistency. You can just leave your playdough white but I like to dye mine. Depending on the amount of colors you decide to do, divide your flour mixture into separate bowls and add your colored water. Playdough has a 6 month shelf life. I used to keep the playdough separate from the other toys so it wouldn't make a huge mess of the playdough (I know, I'm a control and neat freak ... I'm working on this). 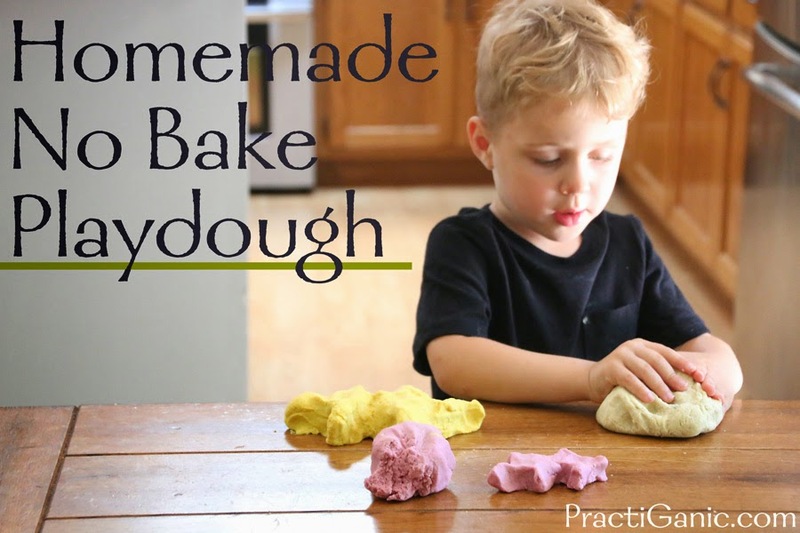 But now that the playdough is so easy to make, I will always have buttons, cookie cutters, straws, matchsticks and anything else on the table that they can build and use their imagination with. If it ruins the playdough, I simply make more!